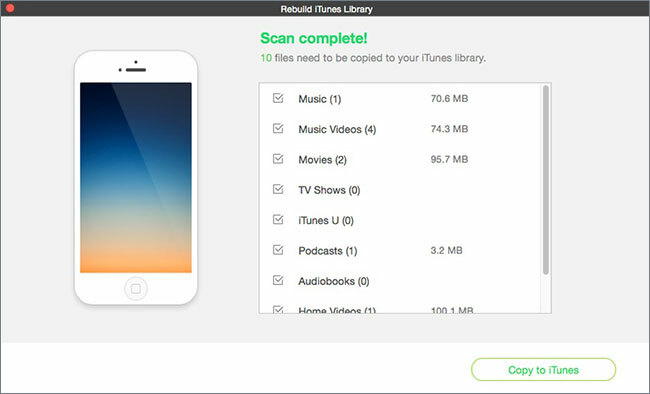 The reason behind restoring iTunes library could be due to moving to a new computer or failure of the hard disk while upgrading to the latest software. If you are maintaining the entire collection on your Mac, you do not have to worry any longer as you could easily restore iTunes library using your iPod. The following guide will give you a walk-through about the process through which you can restore the library. 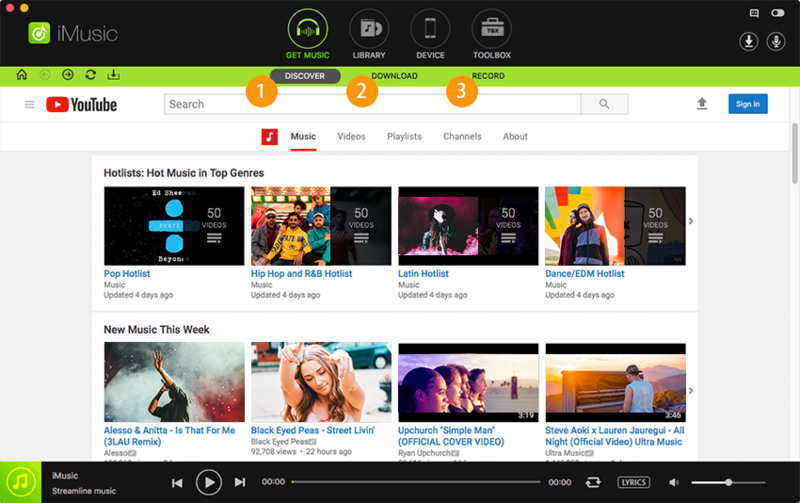 If you wished that you had single software that performed all the activities, then your search ends at iMusic. 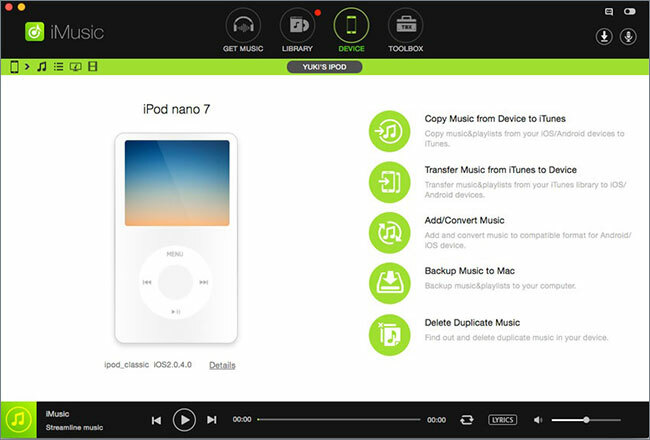 The software is an all in one music manager that is capable of downloading music, transferring media files between iPhone/iPad and Mac/Windows PC, clean up iTunes library, and fix the library automatically. Let us study the important features of the program briefly. 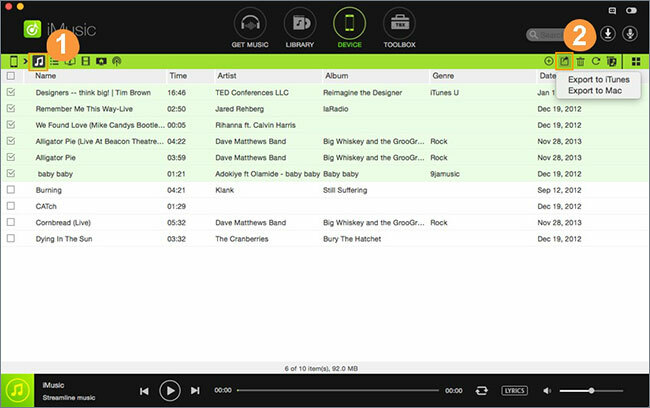 Step 1: iSkysoft is offering the iMusic software for Mac as a free trial. Download and install the version for your Mac from the official website. Now launch it. The product window appears on the screen, showing you all the options provided by the program. In order to advance to the next step, you have to connect your iPod through the company provided USB cable. After successful connection, you will notice the device appearing under the “Device” tab. Step 2: As you want to rebuild/restore the iTunes library from your iPod, click the “Toolbox” option from the menu bar. You will notice the change of the screen, which now has numerous options. From the available options, select “Rebuild iTunes Library” option. 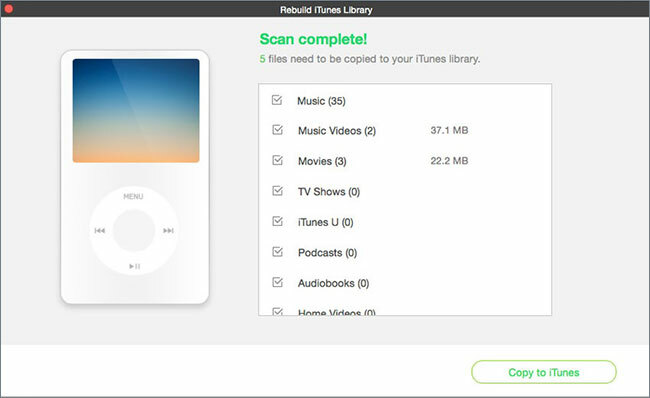 Step 3: Selecting the option will open a new message box that will tell you that the software will begin copying all the files from the connected iPod device including songs, podcasts, videos, playlists, TV shows, and more to your iTunes library. Click the start button in the same window to allow iMusic to begin scanning for the files available on the iPod. After the scanning procedure is complete, the program will display the details as shown in the following figure. Step 4: You can now begin choosing the media files that you wish to transfer to your iTunes library and press the “Copy to iTunes” button at the bottom to start copying the selected files to the library. The program will pop up a dialog box once it completes the action of copying the contents. Remain idle until the software concludes its job. The consumption of time is dependent on the selected contents and their size. Another way to restore iTunes library is by transferring selected playlists/songs/videos from iPod to iTunes library. 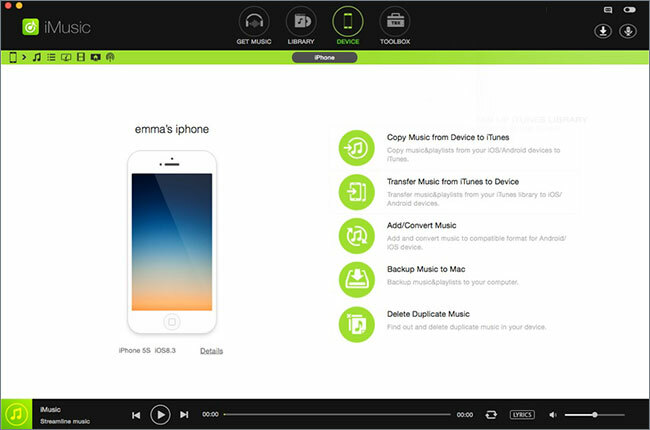 The following is the step-by-step procedure to carry out the process using iMusic. Step 1: Before establishing a connection of your iPod to the computer, disable the automatic synchronization in iTunes. Step 2: Connect the device to the Mac using the provided USB cable. Launch the iMusic software. 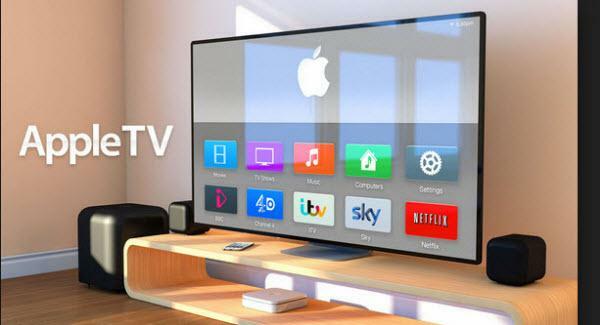 It will show the device under the “Device” tab. 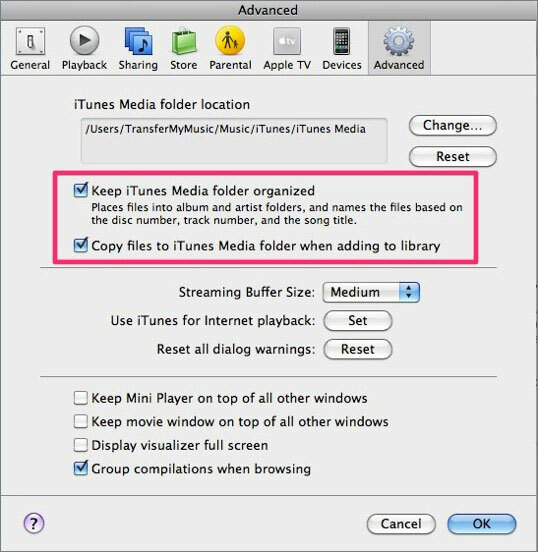 Method 1: In method one, you can begin copying the content to iTunes library by using the transfer music to iTunes option. By choosing this option, iMusic will start moving the files present on the iPod to the existing iTunes library without any duplicates. iSkysoft has the ability to detect duplicates and erase them before transferring to the library. Method 2: In the second method, you can export selected content from iPod to iTunes library. You can do this by clicking the music icon that appears to the left side of the screen. It will display all the media files on the iPod. You can now begin marking the files that you want to transfer to iTunes library. After finishing the selection, press the “Export to” icon that is present on the right side in the menu bar and choose "Export to iTunes library" option. You can also export the content by right clicking on the selection within the window and select "Export to iTunes" option. If any of the songs within your collection are from iTunes store, you can quickly restore them to the iTunes library from iPod by using iMusic. The following guide will give you the procedure to transfer purchased media files to iTunes library from iPod. Step 1: Connect the iPod from which you wish to update/restore iTunes library to the Mac. However, and showed that you disabled the automatic synchronization in the iTunes software, which is available under the preferences tab. Launch iMusic. It will display the device under the “Devices” option. Step 2: Clicking the device option will display a new set of sub-options within the product window. You have to select copy music from device to iTunes option to begin moving the purchased songs present within the iPod to the iTunes library. An interesting feature of the processes is that iMusic has the ability to detect duplicate songs. 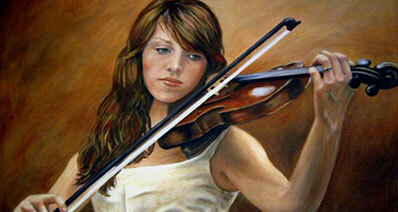 It will help it to eliminate copy of tracks during the transfer process. Clicking the start button will begin the scan process that will allow the program to search for the purchase the songs. After completion, you can click the "Copy to iTunes" button to move them to the iTunes library. 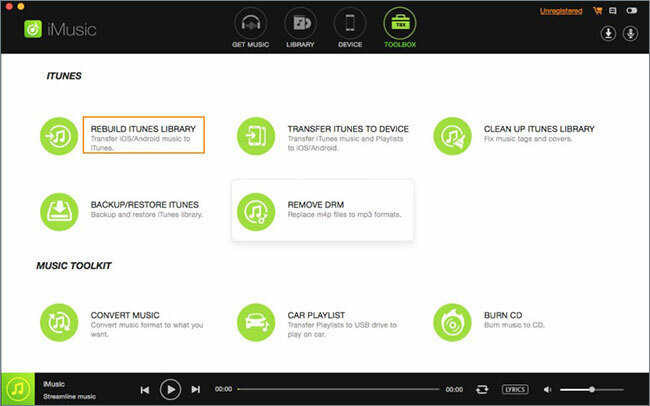 Step 3: The program will display a message stating that the process is complete once it moved all the purchased songs from iPod to iTunes library. iMusic is not only an all in one phone manager but also provides you the features that will help you discover, download, rebuild/restore iTunes library, and fix songs within the library within a short time. The interesting factor about the program is its ability to protect the original contents without causing any disturbance. It even transfers media files from Mac/PC to iOS/Android devices. Given the best features of the program, it is the best solution for you to restore iTunes library using your current iPod.